Assuming you're a Club Mordle member, you can order Geihoza, the giant Glow in the Dark Mordle for $16! 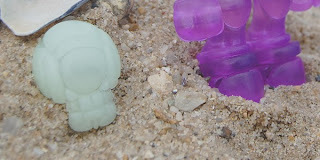 The vinyl figure is compatible with Onell Design vinyl Glyos figures, as it has removable feet. While not Glyos-compatible, Geist Mordles are up too for a measly $10 per set. Click here and log in to order yours - if you have a Club Mordle login, that is. If not, it should be available to you in a few days if any remain. "An update on the vinyl tank project: we are officially out of the prototyping phase and moving on to tooling. There are some new fit functions in addition to what we unveiled at NYCC (thanks to Matt!) but the basic aesthetic won't change that much. Right now I am told a March release is a realistic option, so we're shooting for that. 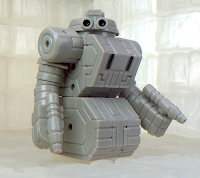 Very excited to share this with everyone, gonna post some pics once the test shots start rolling in..."
Check out this post at the World of ToyFinity for news on the new figures for RoboForce! Enemy the Dictator (pictured) includes extra bonus light blue parts and will cost $20. Hun-Dred the Conqueror (red) will be $18. Maxx Zero t-shirts will be a mere $15. The carnage begins at 9:30 PM EST in the store, so be there! New Mordles are also previewed, but there is no on-sale date for those at this time. Kabuto Mushi Menu Reveal? Maybe! 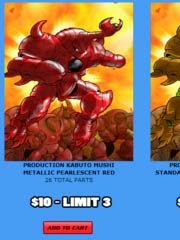 While it's important to say that everything is subject to change, it looks like this post on October Toys' Forums shows that the new Kabuto Mushi figures by The Godbeast may be a mere $10 per. And there will also be a bag of little rubber Mini Mushis for a mere $8. The same red you've seen from Onell and ToyFinity will be included, as will other new colors and the always popular and customizable clear colorless plastic. I'm interested! They look great from the artwork, I can't wait to see the final product! The ToyFinity blog posted Hun-Dred the Conquerer, in red! So that's easy to remember. 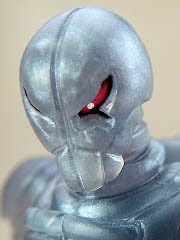 The figure matches the Onell Design metallic, pearly color just released a few days ago. It's quite nice - and will probably make this new Robo Force figure sell out even faster. I've been trying to cut back on some recolors, but the Banimon Red Army Muscle Men were impossible to resist. They're roughly the same size and color as OMFG figures, which come out of the same factory. 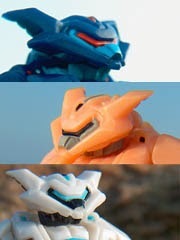 The unpainted pink figure has all the same parts as the previous release, with one big exception - the robot "face" has a large peg nose which is now removable. 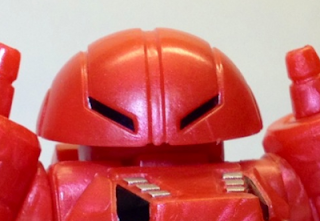 Assuming we ever get more Glyos-compatible nose pieces, you're in for a bunch of fun here. 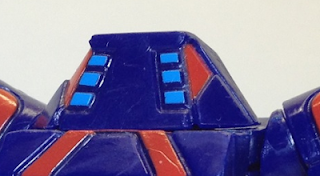 Most likely part of this week's drop (and with colors to match the latest batch of Onell Design toys), ToyFinity teased Enemy the Dictator today! And that's about all they showed... so click through for more, but that's pretty much it. Mine came for free from Kickstarter. Fun fact - Zombie Pheyden, based on Matt Doughty's Glyos figure Pheyden, was shown at Comic-Con a couple of years back as part of Z.O.M.B.I.E. series 2. For whatever reason the series was sadly abandoned, but its most shining star was saved from oblivion earlier this year. The 2 1/8-inch figure comes up to a Glyos Pheyden figure's shoulders, and has no articulation. Mark those calendars - your next shot at a new Robo Force action figure is December 20, 2013. That's Friday! Two colors will be available - but which ones? Click here to see the announcement at ToyFinity, or click here to read the review of the Genesis Edition figure. It's quite good. The figure, not the review. Everybody is getting a mix of freebies from the last Onell Design Glyos Drop a couple of weeks back., from bonus figures to packets of parts. What I got are light blue, dark blue, and black head & belt sets. What did you get? Let us know in the comments! Lost Sincroid Army, Elder Exellis, and Dark Traveler heads are included as is are scarves and Dark Traveler belts. It's a great mix of stuff, and I'll add reviews of the new Nobotos, Gobon, Armorvor, Syclodoc, and more as soon as time and scheduling permits. In the post Unstable Split Personalities Part 1 Mr. Nicholas Merz reveals his glow-in-the-dark and purple figures coming at 9:00 PM EST Friday, December 13. 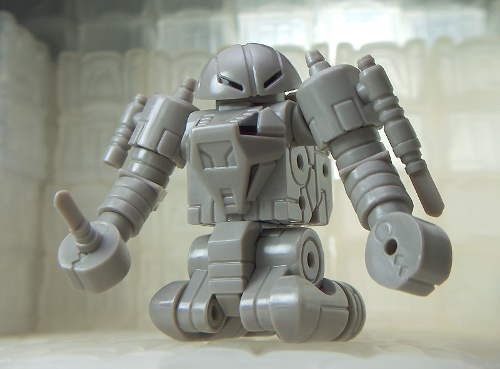 It's a heavy Glyos season! Another figure will also be revealed in the near future. I snagged the Dark Traveler Rift Breaker because of the nifty color and the (at the time) new head sculpt - it was later revealed that grey heads for the Dark Traveler were made and are sneaking out in some new orders, but at this time I sadly do not have one - but I do have this one! I like this figure a bunch, I shot it back in September and I don't know why I didn't finish it up sooner. It's pretty beautiful, and the color is strikingly different from Onell Design's "Voss" green and their 2013 Neo Phase green. It's amazing how a little paint and reconfiguring can make a good figure into a dud, or into something really swell. The Zeta Force Dig Crew is swell. Initially sold at New York Comic Con (and sold online the same day, kudos Mr. Merz) this figure is cast in a silvery plastic with some metallic blue pieces. Green highlights on the ankles, shoulders, and ribs can be easily seen with red eyes and a green skullcap if you pop off the helmet. In the hustle and bustle of the Holiday weekend, I missed that there's a new 481 Universe Drop coming soon! No date was given, but the teaser image shows glow-in-the-dark parts and a purple that may or may not be otherwise special - we'll see! Click here to see the post Dimensional Meiosis at 481Universe.com. On sale now! 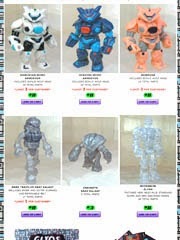 Slate Zone Elite (brown) and Slate Zone Soldier (grey) figures are up for ordering at Store Horsemen for Power Lords club members only. Get yours while you can - they go on sale to the general public on December 4. And here it is! Click here to see the December 2 2013 Onell Design drop menu. The Ecroyex Initiative! No new molds today, but there's a swell Syclodoc that sold out pretty much immediately. The surprises were a pair of orange figures - Noboto and Crayboth - and a generally swell selection of parts and pieces, including another fine Sarvos. There are more indie releases coming - the Four Horsemen will have new Power Soliders on December 2, and more Mordles are expected as well. Stay tuned! A positively preposterously gorgeous drop is on deck for this weekend! Onell Design posted the latest Mission Details, with the Ecroyex Commander Cynorico Sarvos (pictured) being one of several stunning new releases on deck. An equally beautiful Syclodoc will be joining more Crayboth, an Armorvor, and pretty much all of the major molds that aren't vinyl. It's going to be an expensive release, but at least it's some of the most gorgeous stuff you've ever dropped a few sawbucks on, right? 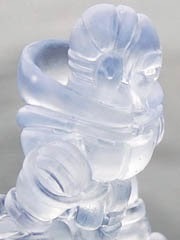 An as-of-yet unknown $8 mystery figure is also up for grabs on Sunday, December 1, at 9:30 PM EST. I was lucky enough to get a Banimon Custom Corps Series 1 #11 figure - don't ask how, it isn't important who died. Click here to see the entire run of 32 figures, many of which incorporated parts from other Glyos figures or newly sculpted or one-off molded pieces. As always these things aren't meant to be played with due to the specialized paint and pointy nature of some of the parts and pieces. 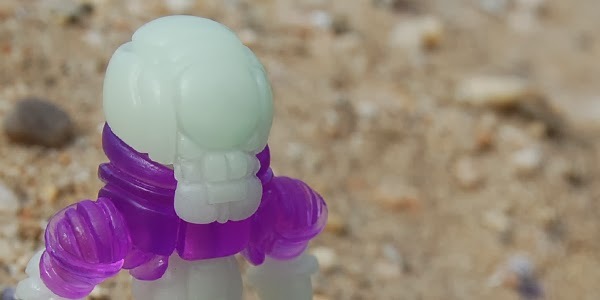 Onell Design Ecroyex Drop - New Glyos This Weekend? 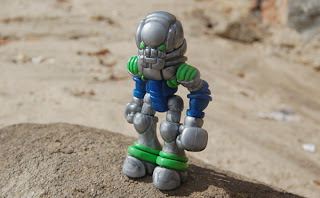 The Ecroyex Syclodoc (pictured) is one of the items being previewed for this weekend's Glyos Drop! Metallic red and blue are on deck, but as to what specifically? Well, we don't know yet - a full menu is slated to be posted tomorrow. There's no secret - the guys behind ToyFinity love Glyos, and the Mordles Imbalance of Bood Vinyl Figure is compatible with the Glyos vinyl pieces. The figure comes to you unpackaged and unassembled, you pop in the feet and you're all set. Each foot plugs in with the same size peg used for Armodoc limbs and Rig arms, so if you'd like to give him guns for feet you can do that. I don't think I'd want to do that, but it's nice to have options. The "neo" in Neo Gatekeeper Reverse Mimic Armorvor references a couple of traveler figures made several years ago in very similar colors. In September 2013, Onell Design brought back the basic palette in new configurations and no panel lines, and the results are staggeringly bright. Or, if you prefer, something out of a late 1980s girl-driven toy line. The pink is quite bright, while the purple is similar to that of all of October Toys' purple exclusive figures. 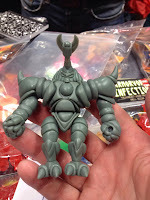 In this thread at October Toys, TheGodBeast himself confirms that four colorways of Kabuto Mushi MK II are coming, possibly very soon. The on-sale date is expected to be December 26, with 4 different colors and a limit of 3 per customer. (Subject to change.) Each figure is expected to be a tiny $10, so save some of your holiday cash for a few of these. We'll update the release calendar as things move into position. Clear Outlanders Are Coming! Stealth Outlanders are coming to the Ni Stuff store on Friday, November 15 at 9:00 PM EST. He will be joined by a number of new custom figures, and at this time no other mass-production figures are shown. The original version of Pheyden has had numerous incarnations from a Stikfas-based prototype to hand-cast releases, eventually making it to fully-tooled made-in-China release. MK II and MK III sold out reasonably quickly, but the original stuck around for a while - and I got one of those a few years ago, it's the darker one in the image nearby. Standard Pheyden MK IV is similar to the previous releases, but is fairly bright and looks closer to what I assume they were going for since the beginning. This is the line's star character, as seen in the Passcode games and comics. It's been almost a year, but RawShark Studios will have another Callgrim Drop on Friday! The Gray Galaxy edition of the character is similar to a matching Dark Traveler a few weeks ago, and it will be joined by a Test Type of the jumbo, massive vinyl Callgrim we've seen earlier. The whole deal goes down at 9:00 PM Eastern on Friday, so be there or don't! The grey is the same as the light grey from the Lost Sincroid Army debut recently. My box came with 2 Sonesidar Mordles (pictured) as a bonus. Maxx comes bagged with no stickers or headers. Maxx Zero is bagged (my bag was opened prior to arrival) with the spare heads, hands, and legs in a separate baggie. It's a lot of toy for $15 - it may be one of the finest toy robot kits since Mindstorms. More later. 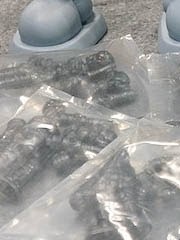 I just got my packet in the mail from Onell Design and this time, I received an unannounced Gray Galaxy Dark Traveler pack of parts. As with before, you get Lost Sincroid Army and Exellis heads plus a swell alternate belt, you lucky dog you. 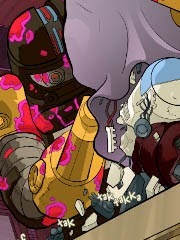 Last time there were also surprised pink and purple torsos, received randomly, but given the selection this time it seems unlikely that there's more out there. What did you get? 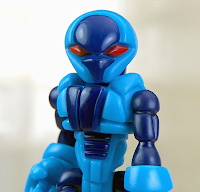 Did you order the new Robo Force Genesis Edition, an update of Maxx Steel of Robo Force fame? If so, congratulations! If not, tough - it's gone! It sold out by 9:03 PM, give or take a few seconds, in the Eastern time zone. Fans of Mordles had ample time to get their figures, but this one - grey with black paint apps - sold out in a flash. I ordered after hitting refresh a few times, and when I peeked at the inventory it was basically gone before I could blink. People love this guy. The figure is almost identical to the ones sold at New York Comic Con, except these have limited black paint applications. It's subtle - you can see a few of them here. This figure - which seems to be the Glyos figure to beat for 2013 - was designed by Matt Doughty of Onell Design/Glyos/this blog's Raison d'être fame. You can see his notes here, in a blog post called Maxx Works, which indicate numerous influences and hidden builds ranging from Tomy's various toy lines including Zoids. You'll also want to see John Doctor Kent's post The Return of Robo Force at the ToyFinity blog, explaining how the return came to be. I need to go read this now myself, so if you'll excuse me. I'm really excited to get my mitts on this one. @Trasufoma @PuppetDevall @toyfinity three minutes! Thanks #roboforce fans. We'll have more in December. Cassette Man Studios wrote in to let us know that there will be a drop tonight - the swell figures will go on sale Friday, October 25 at 10:00 PM Eastern at the Cassette Man Studios store. Taa'lon from the Animus series of figures will be $40.00 when they go on sale. 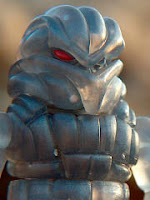 If you like Micronauts, and you love birds, there's really no more interesting hand-made figure on the market today. These swell figures mix original parts and existing Onell Design parts, resulting in a pretty nifty figure that, odds are, you do not yet have. Bah'Glenn Creations updated their store with wares from New York Comic Con the other week - you can grab some pretty nifty figures, including $5 Lil'grinds in various shapes and colors. There are also numerous heads and other items - and if you would like a rocky little buddy to pal around with your Glyos guys, these may be a perfect fit. Take a look! The Mordereus Gobon is very similar in color to a couple of figures sold late in 2012, and the color proved popular enough to bring back for this figure, a matching Noboto, and even the 481 Universe Outlander figure. Could Callgrim be far behind? Or Mordles? I hope not. 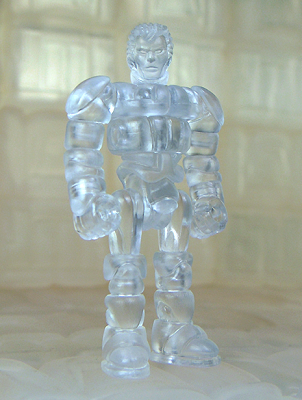 There haven't been many clear Gobon figures since I got into Glyos, and this is the first one I was able to get. I'm happy I did, because the clear plastic allows the figure to amp up its design with an added extra eye in the body - it gives the figure a uniquely different feel without adding significantly to the work involved. Here you go! Click here to see the October 20 2013 Onell Design drop menu. Three new Armorvors, the first-ever pack of trading cards with SideKick Trading Card publishing, a new Glyan head, a Crayboth, and some other goodies. SideKick previously worked on the Art Hustle cards with the Sucklord, and was at one point set to make Outer Space Men trading cards. Click here for more on that. New trading cards were just one of the nifty new items up for grabs tonight at Onell Design! Click here to see what's left at the store right now. The New York Comic Con Dark Traveler + Trading Cards carded bundle is gone, as is the individual Dark Traveler figure. We'll post a new menu shortly, but for now, just go buy before the Armorvors run out. If you supported the OMFG Series 3 project on Kickstarter, you're probably going to get a box in the mail if you haven't already. Supporters springing $25 or more got Zombie Pheyden, a new October Toys Mini-Figure Guy (OTMFG) which will most likely be available in every color in which OMFG Series 3 is sold. Originally slated to be a part of October Toys' unfortunately shelved second series of Z.O.M.B.I.E. mini-figures, Pheyden was instead brought out as a bonus here. He is not on sale individually yet, but odds are you'll see him show up in the October Toys store very soon. For those wanting to see more about OMFG Series 3, stay tuned to 16bit.com for a review later this week. It's official: Onell Design has another drop Sunday, October 20 at 9:00 PM Eastern! So far we know we can expect 3 new Armorvor figures and the glittery Dark Traveler figure as seen to the left - very cool. A slightly different take on his Outlander build, the NV Subject is great evidence of the creativity employed in this figure's design. The 17 parts are mostly the same as Silas, but with elements of the arms and legs swapped to give the figure a different, far more awkward look and feel. 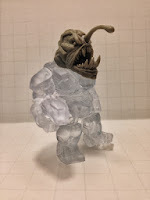 This figure does a great job illustrating the versatility of the Glyos system while dancing along the razor's edge between a great figure and a bit of a dud. 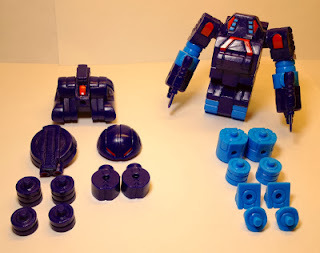 It's a step to the side with a quarter-step back - good for customizers, nice for variety, but at this point it would seem collecting the entire family of production figures is not only difficult, but a little bland. Getting some, though? That's a good idea. 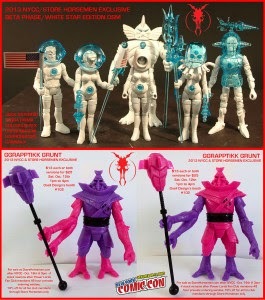 PSA: The Outer Space Men NYCC White Star edition are up for grabs on Wednesday while the Power Lords Ggrapptikk Grunts will go on sale this Thursday, October 17, at 3:00 PM Eastern. The Outer Space Men are open to the public, while the Ggrapptikk Grunts are going to Fan Club members only - how this will be done, I'm not sure yet. Also, it means you may not be able to order both at the same time, allowing Store Horsemen to double their workload and restrict saving you on shipping should you wish to buy both sets. 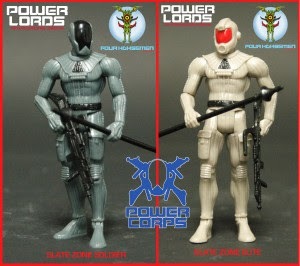 The Power Lords figures are $13 each, $25 for the pair, and/or 25% off for Club Members. 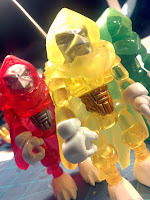 The Outer Space Men are $70 for the lot ($35 per 3-pack), or $11/16 each. The last new release of Callgrim PVC figures was in January 2013, so this is more than a little significant. I am unsure if other new colors were hown. At NYCC, Onell Design brought about 100 carded dark, clear smoke with glitter Dark Traveler figures. You can see a whole basket of them at Plastic and Plush, and at this time I do not know how a) I can get one, b) you can get one, or c) much it cost. ...if you bought one, please, let us know the gory details. 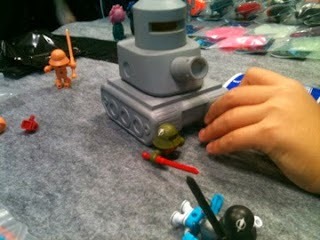 The blog Nemo's Factory posted this and other images, with the Banimon Tank being qutite the surprise. Will it roll? Do figures fit inside? Can the turret work as an Armodoc head? We don't know yet - but if we find out, we'll share with the rest of the class! 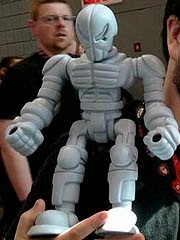 NYCC: Giant Callgrim En Route? Gentle Giant gave us jumbo Kenner Star Wars figures, so why shouldn't RawShark Studios give us a Jumbo Callgrim? At NYCC, the great Vangelus (Chris Ho) snapped a picture with himself next to this giant, seemingly Shogun Warrior-sized version of Callgrim. As of yet I've been unable to find any information about pricing, availability, if this is just a prototype, or what, so I'm just going to go ahead and post a link to his picture on Twitter for now until I know more. It's BIG. So I'm assuming that if this comes to pass, it's going to be $100-$150 easy. Update: Vangelus tells us that if he recalls correctly, this figure was $250, which looks about right. Looking at pictures on Plastic and Plush and ToysREvil, it looks like this one is about 12-inches tall, give or take. Compared to a Syclodoc in a picture, and Jesse Moore's forearm in another, this seems about right. A new Armorvor head sculpt, courtesy of Jason Frailey! The Angler sculpt seen here has a removable antenna and a movable jaw. Click here to see more pictures on Mr. Frailey's blog! As far as I know it is not for sale at this time nor is it being produced just yet, if at all. It is pretty spectacular, though! 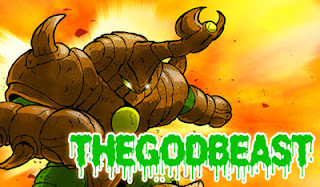 To the left, see a picture of the test shot that I stole borrowed from The Godbeast's page. Last year, Onell Design gave us a great wave of 3 new Armorvors (glow, grey, and purple) all at once. It was glorious. 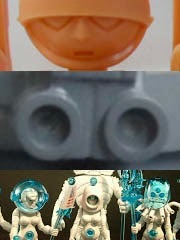 This year we have 3 more currently nameless figures in blue, flesh (it seems) orange, and ivory colors! These will be on sale at NYCC this weekend, and for sale online at some point presumably later this month. As always, yeah, I'll need that set. 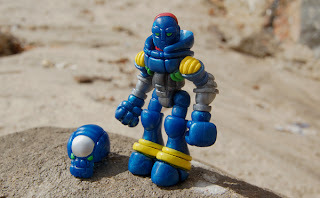 After some teasing, here's the first really good look any of us have really seen of Maxx Zero, a new fully Glyos-compatible figure from the new Robo Force line. John Kent writes: "It has been a long year of work to get Maxx Zero, Hun-dred and the rest ready for their return, but the figures are ready and attendees of NYCC will have the chance to get a special preview edition of these figures. 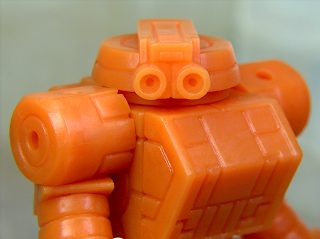 Above, see Maxx Zero himself in orange test-shot colors. He's 100% Glyos compatible and ready for all new missions." Also in this post, he reveals new red Mordles with black highlights. A large, jumbo Mordle has been teased to the masses and fully revealed to Club Mordle members, and hopefully all of this fun will be up for grabs shortly. It is unknown what this nifty Maxx Zero will cost, what the first deco will look like, and all that jazz. He certainly looks exciting though. Not at NYCC? There are a few - very few- as in, under 20 left - of the two new Ni Stuff figures. Click here to check availability, right now, as they're probably gone. Zeta Force and Maigus are up now, but remember his figures tend to be lower run and some will be at the show - so good luck! The paint jobs look exquisite from the pictures and I can't wait to see them up close. This is a pretty great figure from a pretty superlative release. The last drop was exceptionally great - this was the first opening I had in the schedule since its delivery, and I was having a heck of a time deciding which figure to review first because they were all quite good. I went with the Lost Sincroid Army Genesis Corps due to the coloring and ease-of-showing-up-on-screen - the Dark Traveler Rift Breaker was the other really great one as it's also packed with surprises. 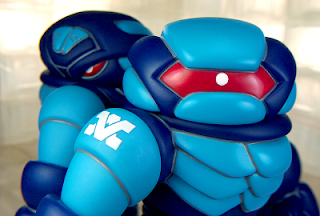 In addition to NYCC Exclusive Power Lords, the Glyos powers that be also revealed More Ni Stuff 481 Universe Outlanders. And these ones look a lot better! Maigus is a blue guy with tons of painted details. Joining him is The Zeta Force, a silver figure. I want both. Each will be $10 and sold at New York Comic Con this weekend, and Ni promises they will be sold online during the show. There's a lot of news, but the most important thing is the NYCC Onell Design Booth Schedule. The booth isn't a traditional booth - the sellers and vendors are swapped out regularly, making it a convention unto itself. ToyFinity, Real-X Head, Spaced Out Design, The Godbeast, Bah'glenn, Rawshark, and everybody else that matters will be here - even the Four Horsemen. It's killing me that I can't be there too, but if you can go, be sure to stop at NYCC booth #102. It's looking great!